(intransitive) When you leave a place that you are frequently in, or a place that is tiresome or mundane. This is often used when you are expressing frustration with a situation. Synonyms are depart or exit. I need to get out of the house more. Work is so boring; I need to get out of here. Paul, get out of this classroom now! (intransitive) When information is supposed to stay secret or quiet, but is passed around and shared anyway. Synonyms include divulge, announce, make public. Unfortunately, my secret got out before I wanted it to. I didn’t want to tell people about my engagement yet, but the news got out. Once the news got out, it quickly spread around campus. 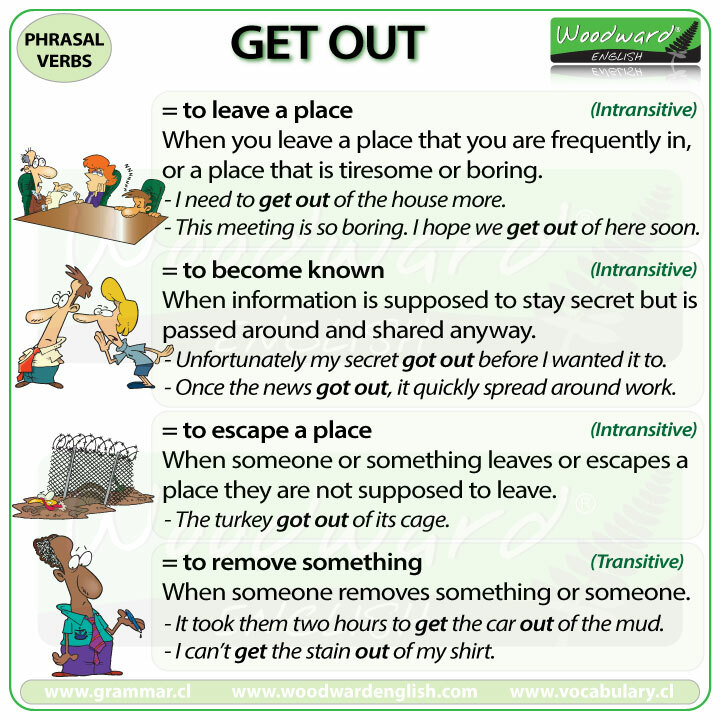 (intransitive) When someone or something leaves a place, sometimes by escaping when they were not supposed to leave. Synonyms are flee or run away. The horse got out because I left the stable door open. The criminals got out of town before anyone knew they had escaped. (transitive) When someone removes an item or someone from a place. Synonyms are remove or extract. Note: The object goes in the middle between the two words. It took them two hours to get the car out of the mud. I got my old guitar out of the garage so that I could start playing again. I splashed spaghetti sauce on my shirt and I can’t get the stains out.